Chopped herring, sour apples and eggs are an unusual combo of ingredients. Forshmak has an odd combination of ingredients that might scare off some food lovers, but those who are undaunted will find the flavor is divine. "Without further ado, the bashful Alexander Yakovlevich invited the fire inspector to come for dinner to eat whatever God would send. That day God sent Alexander Yakovlevich the following for dinner: a bottle of Zubrovka vodka; home-pickled mushrooms; forshmak made of herring; Ukrainian borshch containing Grade 1 meat; chicken with rice; and compote of dried apples." This meal from the legendary Soviet novel, The Twelve Chairs, by Ilya Ilf and Yevgeny Petrov, embodied the culinary dream of most Soviet citizens. What could better capture the imagination than home-made borshch and forshmak? Lobsters would have been out of place. Homely forshmak, however, without which this menu would not have been so appetizing, was another matter altogether. Given the food shortages in the USSR, it was not so easy to get hold of different delicacies, but herring was generally on sale all the time. In German, forshmak means "foretaste," and it is served as an appetizer before the main dish. The first mention of this appetizer dates to the early 18th century. Jews refer to it as gehakte herring, meaning "chopped herring." A book by culinary historian Vilyam Pokhlebkin has this to say about forshmak: "A cold dish characteristic of Jewish cuisine. It is a pâté made of minced herring, prepared without heating." Although forshmak is regarded as part of traditional Jewish cuisine, it was widely known and liked throughout Russia. A recipe for forshmak is to be found in a manual by A. Shambinago published in 1860 under the title, A Household Book for Young and Inexperienced Housewives. Forshmak's popularity has subsequently grown apace, making it a truly Russified dish. The main ingredient is herring, which was voted as a favorite fish among Russians in a recent survey by the Russian Public Opinion Research Center (VCIOM). This appetizer's recipe could, at first sight, seem intimidating. 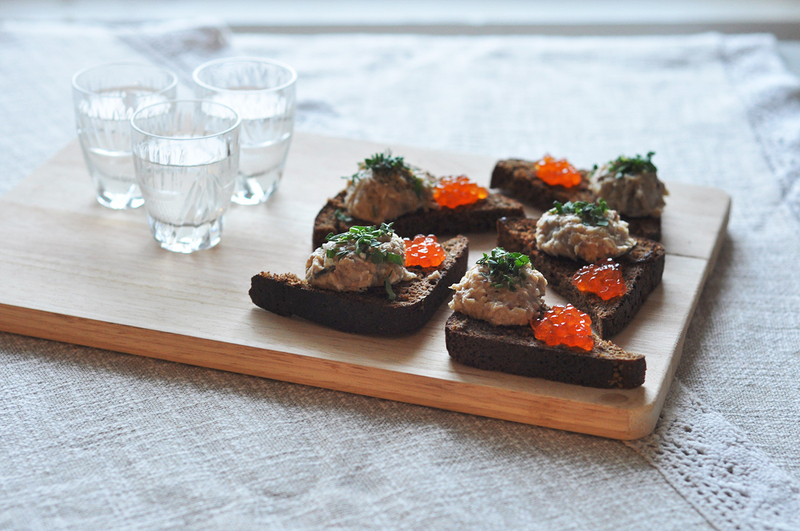 Herring requires lengthy soaking in water, sour apples, and eggs; but it all goes well together and looks very appetizing on a piece of toasted black bread. Pokhlebkin advises to soak the fish in milk or tea for several hours, but if the herring is not too salty then this is not necessary. In bygone eras, when the fish was salted in large barrels and preserved for a long time, it really was very salty, but these days it's no longer necessary to reduce the excess salt. Naturally, everyone has their own secret method of preparing this starter. The traditional Jewish recipe differs from the classic version in that it adds bread and also a little lemon juice. But everyone knows that the best version of forshmak is "as Granny made it." 1. Place the herring on a chopping board (it is best to line the board with paper to absorb the smell of the fish, and to use gloves). 2. Use a sharp knife to cut along the center of the belly, from head to tail. 3. Remove any roes and all the guts, then cut off the head. 4. Rinse the fish and cavity well in cold water to remove any dark film and bitter-tasting traces of the innards. 5. Put the herring back on the board and make an incision on the backbone starting at the head and slice all the way to the tail. Cut off the fin and discard. Remove the fin near the tail in the same way and throw away. 6. Remove the skin, detaching it from top to bottom. 7. Detach the fillets starting with the head, first one half of the herring and then the other. 1. Chop up the herring fillets, remove any small bones and soak in water or milk. 2. Peel the apple and remove the seeds. 3. Mix all the ingredients together in a food processor. The egg is best grated by hand. 4. Mix together in a bowl and place in the fridge for an hour. Serve on toast as a starter.